* Exceptional build quality. All metal construction. Heavy, and when we speak of amplifiers, heavy is good. * Pure Stereo design. Two independent monoblocks from beginning to end of path. 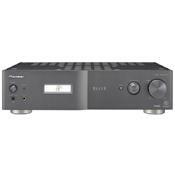 * More than enough audio inputs for every need and source, including Phono and USB. * Minimalistic and overconservative exterior design, not everyone's cup of tea. * Some really strange sound adjustments. In my own opinion, good for one type of music (rock, pop), not so for another (classical, jazz). You have to try it yourself to know if is yours, but definitely is not a "one-size-fits-all" type amp. I obtained this unit for a trial listen over the weekend before I purchased it. This is a very clean and clear sounding receiver. The features were nice and the remote was easy to use. My problem was that there was an exteme lack of rishness to the sound. The lows in the midrange spectrum were distant and weak. Sound in the baritine range and slightly above just were not present. I played with the bass but it made matters worse. For the record, I am not a bass fanatic. I would never own a subwoofer. I hate that thump-thump-thump, so for me to complain about a lack of lows is very odd indeed. I really wanted to like this unit. The price was right at $500, but I should have guessed there was an issue when they still had several in the box after over a year. If you like a very crisp, clean sound with minimal warmth and mid-lows then you will be happy with this unit. Otherwise stay away and look elsewhere.